2018 has so far been a bumpy ride for those of us paying attention to the foundational issue of trade justice. From sanctions to tariffs and threats of trade wars, there has never been a dull moment from the Trump Trade team—quite the opposite, there is always something to write home about, and our next webinar is going to focus on where we will be on NAFTA Replacement, some of the less well-known but nonetheless crucial aspects of a “modernized” North American Free Trade Agreement, and why we need to stand our ground for trade that protects people and works for a sustainable planet. Future generations depend on us. William Waren, Senior Trade Analyst with Friends of the Earth, U.S. will fill us in on the details of Friends of the Earth’s take on extremely important chapters some of us hear little about. The new Regulatory Review chapter in NAFTA, for example, involves corporations forcing countries to harmonize our laws and regulations to match up to the trade pact’s demands. This is particularly egregious when it comes to climate change and clean energy, fracking, regulating toxics, bee-killing pesticides, food labeling, and other “technical barriers to trade”. FYI: “barriers are regulations passed in the public interest to preserve our water, our air, our food, that global corporatists see as impeding their future profits. These “technical barriers to trade” protect our health and the well-being of the planet on which we depend for survival. Yet, believe it or not, the drafters of NAFTA and TPP are writing enforceable laws to undermine these important safeguards. Consider that we want to move forward to mitigate and prevent climate disaster and water degradation, presumably, we could be barred from, for example, banning fracking or drilling, or even banning toxics. The shocking truth about the numerous new NAFTA 2.0 chapters is they are regurgitated from the TPP. 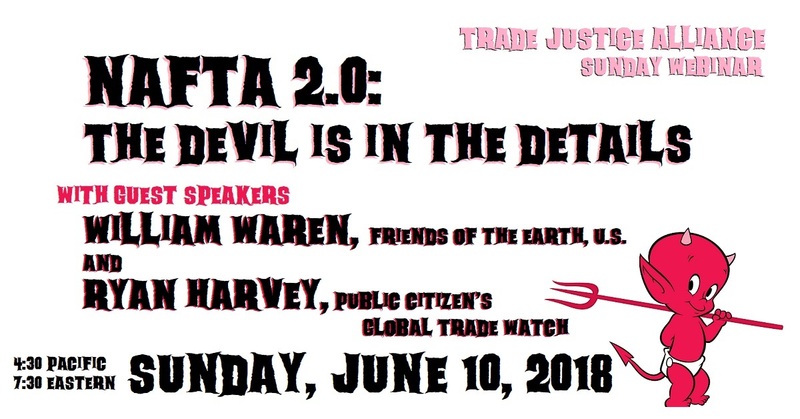 We will also hear from Ryan Harvey, a brand-new National Field Director with Public Citizen’s Global Trade Watch. Ryan comes to GTW with an impressive background in trade activism from the Seattle WTO protests to the Miami Free Trade Area of the Americas protests—both highly successful campaigns. He also worked with the Coalition of Immokalee Workers on their Fair Food Campaign. Ryan will give us an overview and update with action alerts for the #ReplaceNafta campaign—the push to eliminate ISDS and much more.